Teach your customers to unlock your product’s full value. The more features they use, the longer they’ll remain loyal customers. This doesn't mean just answering their questions. It means showing them how to dive into all the features and benefits your product has to offer. Create dedicated courses for different segments of your audience. You can easily assess learners’ knowledge using the quizzes feature. You can also automatically reward all learners with a certificate upon completion of their education. Let’s say the user already understands why they should use your product, and now you need to help them begin to do so. If a user has already been using your product for a long time and is happy with it, you can’t always be teaching them something new. But they are loyal to your product. What about the benefits for Marketing? 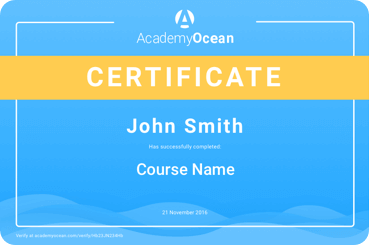 Want to see AcademyOcean in action?